Ultra Magnesium Salt is the world’s highest magnesium salt – more than fifty times the magnesium of Himalayan pink salt. It contains ancient sea minerals and is solar crystallised and hand harvested from Lake Deborah in Western Australia. 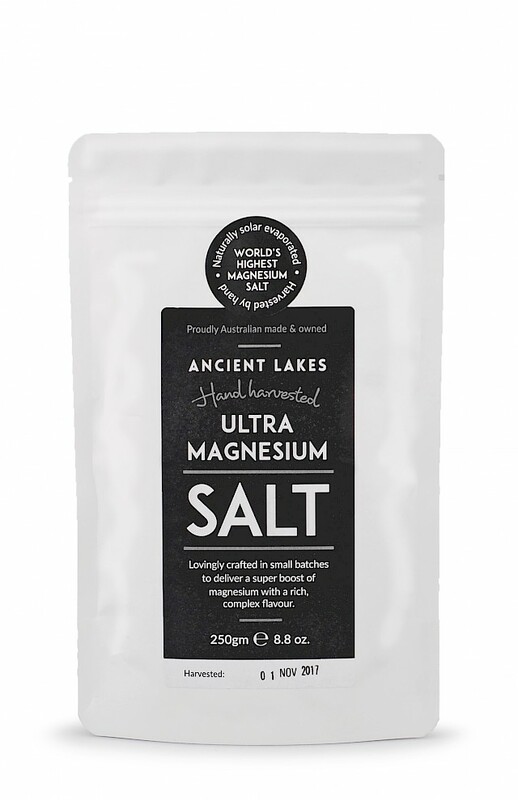 Crafted in small batches, this salt is perfect for boosting your magnesium intake while adding a rich, complex flavour to food. Packed in a 250g pouch, this bag can be used to refill your Ultra Magnesium Salt glass jar. Directions for use: Perfect for boosting your magnesium intake while adding a rich, complex flavour to food. Completely natural, sustainably harvested and 100% Western Australian. Ingredients: 100% natural magnesium-rich salt.